Pile up all cards on the circle in the tree so that a clock is formed, where every hour is in the right place. All cards that lie at the bottom of the game, need to be piled up on the circle in the tree. The cards that are in the circle need to be placed in increasing sequence and need to be of the same type; spades on spades, clover on clover, etc. First select the card you want to move and then the card you want to place it on. The king is the only card that dos not represent a number on the clock. It is only used to complete a string of cards. For instance to go from a ‘queen’ to a ‘2’: first place the king on the queen, then the ace and then the ‘2’. 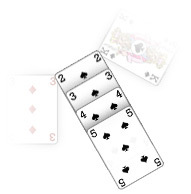 The cards at the bottom can be moved to other piles at the bottom. These cards need to be placed in descending sequence but, opposite to the card in the clock, do not need to be of the same type. When a pile at the bottom is cleared, you can place a card from an other pile at the empty spot. This way you have more free cards that you can place on the tree. Try to play the game as effiecient as possible, because for each unused turn you will receive 10 bonus points. You can make a combo if you place several card in a row on the clock. The combo is ended if you replace cards at the bottom from one pile to an other.